A history and analysis of the revolution in which socialists aligned themselves with Islamists to overthrow the West-backed Shah. Following the success of the revolution, the Islamists instituted a theocratic dictatorship and wiped out the workers' movement and the left. Religious fundamentalism, whether Christian, Muslim, Hindu or other deserves to be closely examined because it has increasingly become a player on the world stage in recent years. On the one hand, many media commentators and pro-war agitators were not slow to characterise the wars in the former Yugoslavia, Sudan, Chechnya, Palestine/Israel and Afghanistan as "crusades" against the Muslim populations or "jihads" against Christian or Jewish people. On the other hand, many religious working class people who have borne the brunt of these wars - especially when driven by US imperialism as in Afghanistan - have succumbed to the false belief that they are being protected by their domestic theocratic (religious state) regimes. The debate around the supposed "revolutionary" nature of some religious fundamentalist regimes is similar in many ways to the debate on the "liberatory" nature of national liberation movements. Although the relationship between anarchist revolutionary workers and religious (or nationalist) workers fighting for a better life is complex, given the current war on the Afghan people, an examination of a genuine workers' revolution in a majority Muslim country is probably the most effective way to clarify our position. So we will look at what happened during the Iranian Revolution of 1978-1979. Iran is an important test case firstly because until the revolution, Iran was one of three key pro-Western strongholds in the Middle East necessary for suppressing local worker demands and keeping oil production cheap (the others being Israel and Saudi Arabia). Secondly, because the revolution - or more correctly, the Muslim clerical counter-revolution that destroyed it - was to the Arab, Kurdish and Persian world what the Russian Revolution was to the European world and has provided the "model revolution" debated amongst anti-imperialist and revolutionary Muslim workers ever since. Iran developed great strategic importance for the imperialist powers (especially Britain and Russia, then later the USA) following the discovery of massive reserves of oil there in 1908. The Iranian oil industry concentrated more workers together than any other industry in the Middle East, with 31,500 working in oil production by 1940 - but most of the profits went to Britain. The following year, Russia and Britain invaded Iran and installed a puppet ruler (shah), but worker militancy was on the rise. The Communist Party of Iran had collapsed in the 1920s, but new leftist and nationalist forces came into being and organised industrially: the communist-inspired Masses organisation and the National Front. A crackdown by the British-backed shah's forces in the late 1940s drove the movement underground. 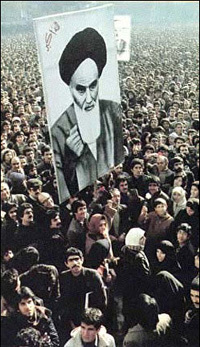 But despite the intensive activities of the secret police, militant cells of workers - and, operating in parallel, religious fundamentalist scholars allied to the exiled Ayatollah Khomeini - re-emerged to agitate for change, especially during the 1963 revolt, and starting again in the early 1970s. Increasingly, the extravagance of the shah's Pahlavi dynasty provoked resentment in all parts of Iranian society, even among the middle classes which were traditionally strong supporters of the regime. In August 1977, 50,000 poor slum-dwellers successfully resisted their forced removal by police, then in December, police massacred 40 religious protestors and the resentment boiled over into open anger. Strikes and sabotage were on the rise while wages dropped due to an economic downturn. The shah imposed martial law and on "Black Friday", September 8, 1978, troops gunned down thousands of protestors. In response, infuriated workers launched a strike-wave that spread across the country like wildfire. Oil workers struck for 33 days straight, bringing the economy to a dead halt, despite fruitless attempts to send troops into the oilfields. On December 11, 2 million protestors marched in the capital, Tehran, demanding the ousting of the shah, an end to American imperialism and the arming of the people. Soldiers began to desert. On January 16, 1979, the shah fled to Egypt. In mid-February, there was an insurrection, with air force cadets joining with guerrilla forces - the leftist Organisation of Iranian Peoples' Fedai Guerrillas, or Fedayeen, and the nationalist Mujahedeen - in over-running the military academy, army bases, the parliament, factories, armouries and the TV station. The Pahlavi regime collapsed and Khomeini, who had returned from exile, cobbled together a multi-party provisional government, but the people wanted more. Women's organisations flourished, peasants started seizing the land and in some places, established communal cultivation councils, strikes were rampant and workers seized control of their workplaces, arranging raw materials, sourcing and sales themselves, even setting prices in the oil industry. A system of grassroots soviets - called "shoras" in Iranian and based on the old factory council idea - sprang up in fields, factories, neighbourhoods, educational institutions and the armed forces. Armed neighbourhood committees - called "komitehs" - based on the old Muslim scholar networks - patrolled residential areas, arrested collaborators, ran people's courts and prisons, and organised demonstrations. It was a true workers' revolution with secular revolutionaries and Muslim workers overthrowing the capitalist state side by side. A May Day march in Tehran drew 1.5 million demonstrators. The former headquarters of the secret police-controlled official trade union federation was occupied by the unemployed and renamed the Workers' House. The new workerist federation, that replaced the old state one, the All-Iran Workers' Union, declared that its aim was an Iran "free of class oppression" and called for shoras to be "formed by the workers of each factory for their own political and economic needs". But the religious fundamentalist clerics lead by Khomeini were terrified of the power of the working class and haunted by the spectre of the imminent collapse of Iranian capitalism. If it collapsed, they could not reconstitute themselves as the ruling elite in place of the shah and there would be no profits for them to steal from the workers. Three days after the insurrection, the provisional government ordered workers back to work, but the strike, shora and komiteh movements just spread. A month later, the government declared the shoras to be "counter-revolutionary", claiming that their minority bourgeois regime was "the genuine Islamic Revolution". Still the shoras spread, so the regime introduced a law aimed at undermining worker self-management by banning shora involvement in management affairs - while at the same time trying to force class collaboration by insisting that management must be allowed to participate in the shoras. The shora movement peaked in July but then the government offensive, combined with the inexperience of the left, began to take its toll. The National Front, Masses, Fedayeen and both the leftist and Muslim wings of the Mujahedeen all backed the provisional government, mistakenly believing that an Iranian clerical-dominated bourgeoisie was better than the imperialist-backed Pahlavi dynasty. Khomeini founded the fundamentalist Iranian Republican Party (IRP) to squeeze opposition parties out of the provisional government and at the same time established the Revolutionary Guards (Pasdaran), a political police force to marginalise the secular left within the komitehs, which it wanted to mobilise as a supporter bloc. The Pasdaran were soon forcibly liquidating shoras, purging komitehs and repressing ethnic Kurdish separatists and women's organisations, while the Party of God (Hezbollah) was created as a strike-breaking force of thugs. The IRP also created a public works project to divert the energies of the most militant shoras - replacing them with fundamentalist shoras and Islamic Societies - and to rebuild the exploitative capitalist economy (all the while spouting populist and anti-capitalist slogans in the manner of all fascist dictatorships). The true workers' revolution was destroyed and for the Iranian working class, whether secular or Muslim, a long night of living under a new autocratic regime had begun. When & where was this originally published? I would imagine in South Africa sometime in the last ten years.